Over the years, I have explored almost all of the Bizz Johnson Trail. Following the old Fernley and Lassen Branch Line of the Southern Pacific railroad, the trail winds 25.4 miles from Susanville to Mason Station. For the first 16 miles, the trail follows the Susan River. As it winds through the rugged Susan River Canyon, the trail crosses the river 12 times on bridges and trestles and passes through two tunnels. In 2003, Sharon, Jack and I hiked from Devil's Corral to the old railroad tunnels. 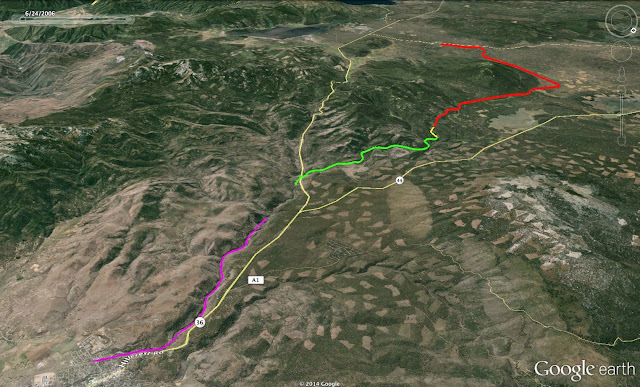 On the map, this is the unmarked section between the purple and green lines. In 2005, Sharon, Jack and I hiked a couple of miles along the trail starting from Mason Station. This is at the beginning of the red line at the top of the map. In 2008, Jack and I rode our mountain bikes from the Susanville Depot up the trail to the railroad tunnels. This is the purple line on the map. There is a picture here. More maps and Google Earth images are here. This is probably the most interesting part of the trail. I am going to try and get Tomasin and I to ride this section again next year. In 2009, Jack and I rode our bikes up the trail from Devil's Corral. This is the green line on the map. There is a picture here. More maps and Google Earth images are here. In 2014, I rode from Mason Station to Goumaz Station by myself. This is the red line on the map. There is a picture here. Tomasin and I also rode a shorter part of the red line earlier in the week. This leaves a very short section of the trail that I have not covered at least once. This is the yellow line on the map; it measures just about 0.6 miles. Every 30 for 30 film in one set? !